I just had to start them. The yarn was calling to me, in a muffled, pleading little voice, from the bottom of the bag. This just might be the nicest sock yarn I’ve ever worked with — no wonder it’s legendary. The fabric is soft and smooth on US 1 needles, and my gauge is working out to about 8 stitches to the inch. It’s not splitty, either. The colors flow without pooling so far (four inches is hardly a good sample) but I won’t mind if they do. 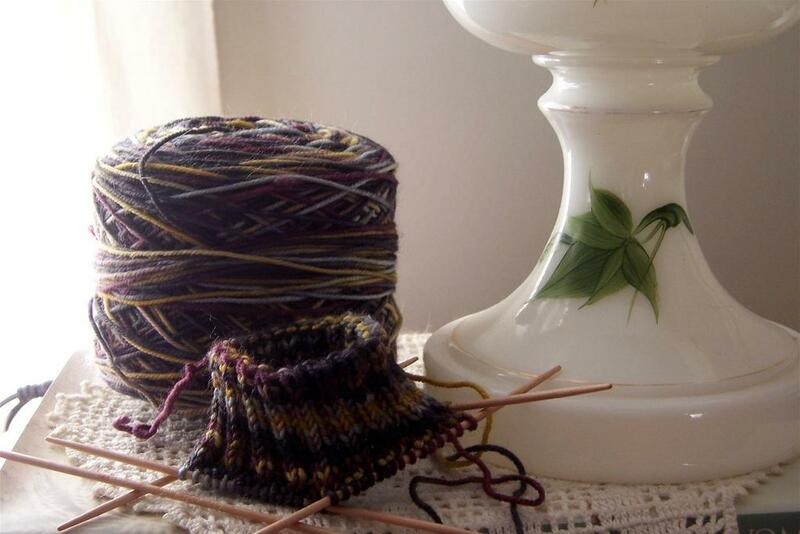 I’m making a plain pair of socks this time, just because I am loving the knitting with this yarn. Socks That Rock rocks. Ten years ago… I had just begun working at the bookstore, after spending two years working at this and that, living here and there. I’d always loved books, but I had no idea that I’d take to it so quickly, or that my brain was made for this work, or that I would find as much satisfaction in it as I had in weaving and spinning. My home was a little basement apartment, but I spent much of my time at J’s house, helping her run her husband’s landscaping business and hanging out with J and the wonderful babyR’s and their equally wonderful big brother M. I was still in the process of finding my way in the world. My fur companion was little Emma, who’d accompanied me on my long journey to this place by the sea, and made sure I was safe and sound. Five years ago… I’d become the manager of the Southampton store and had navigated most of the way through a really rocky stretch of road. I’d found a sweet studio apartment close to the store, which I share to this day with my cat Annabelle (who was sent to me, I believe, so that the road would seem less treacherous). One year ago… I was still basking in the glow of my trip to Italy. It changed and fortified me, and even now I have a deep sense of contentment when I remember that week. Five snacks… Crisp, crunchy apples; Chocolate; Peanut butter-filled pretzels; Cheese (the sharper the better); A big Starbucks Frappuchino. Five songs I know all the words to: “Angel from Montgomery” (the Bonnie Raitt version, please); “Boulder to Birmingham” by Emmylou Harris; “Lay Lady Lay” and just about every song on Nashville Skyline; “This Shirt” by Mary-Chapin Carpenter; “You Are My Sunshine”. Five things I would do with $100 million… Build or buy a house somewhere where I could live forever; ensure that all my nieces and nephews could go to college or start a career; make sure my mom is comfortable and that she doesn’t want for anything; travel, and take my time about it; save some, give the rest away. Five places to run away to… The ocean (does that count, since it’s practically down the road? );Italy; the movies; my old home in Virginia (hey, I could buy it back with some of that $100 mil! ); the Southwest. Five things I would never wear… High heels; fur; neon anything; a bikini (this is so laughable that it shouldn’t even count); novelty-yarn sweater in any way, shape or form (scarves are okay); lots of flashy diamonds (though one would be nice). Five Favorite TV shows… Lost (what time is it? ); ER (the old ones are the best); I adored the Loretta Young show when I was little; early Masterpiece Theater; House Hunters (so corny it’s good). Five biggest joys… Knitting, Knitters Review, my dear friends (including Miss Annabelle), my far-flung family, the smell of the ocean. Five favorite toys… My computer and the internet, my sheepy tape measure, all my knitting and spinning stuff, my Treo 650 PDA/phone/MP3 player; and my digital camera. Five people to pass this on to… This might be impossible, since I’m so late posting this. Okay. Vi, who counts as all five because she has all those cats and chickens. Hi! Thanks for coming over and supporting my own STR habit, LOL! Isn’t the yarn so wonderful. I’m wondering if I should’ve bought more.Your socks are looking wonderful – not sure how I missed that colorway, but it’s beautiful! Can’t wait to see how it plays out.I’m about to start the heel on my second sock, and if I wasn’t compulsively weighing the yarn every five seconds, I’d probably be finished already. Right this second, I think I’m going to have enough. But I reserve the right to change my mind. I love LOVE catching up with your blog. You can really write my dear and always inspirational and greatly gentle. Thanks for sharing all that you share.